I attended the 3rd ACF GreenHome Community workshop on Tuesday night. It was a great evening, with many passionate people from Caroline Springs, Melton West, Melton South, Altona, Werribee, and Bacchus March all who want to make a difference to our local communities. Terry White from Western Alliance for Greenhouse Action gave an inspiring presentation about some of the bigger actions that are possible in the Western region of Melbourne. I filmed the entire presentation and managed to cut it into two parts and place them on YouTube. Terry’s presentation was very inspirational, and well worth watching. Please put your hands together for Terry! P.S. Terry only lives down the road from me so I gave him a lift home as well! 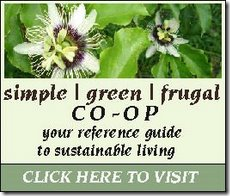 My main post for today is over at the Simple, Green, Frugal Co-op, where I ask ‘Why do Women get it, but Men don’t‘. It was a subject may have been a touchy one if I didn’t articulate it correctly, however I think I managed to pull it off. There are so many fantastic comments, it makes for a very good read. Please pop on over and check it out, comments and all. It has been a while in coming, so here is this weeks podcast which just features my good self, talking about what I considered before I designed my food garden. I hope you enjoy my chattering.